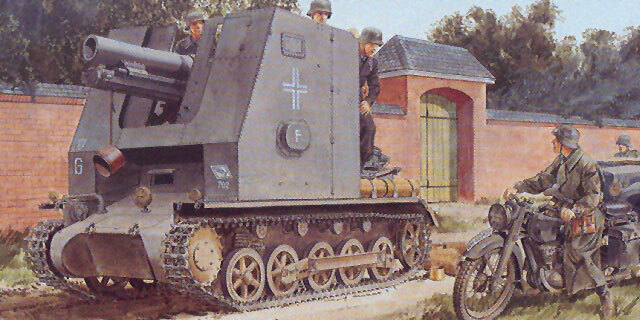 The Germans figured out early in WWII that they needed highly mobile artillery for direct support to infantry units, and horse-drawn guns were not going to cut it. Therefore in early 1940 they converted 38 Pzkw. I Ausf. B light tanks – which had shown themselves to be obsolete by that time – into self-propelled mounts for the 15 cm s.IG. 33 heavy infantry howitzer. This was a powerful but relatively short-ranged weapon (4700 meters maximum with a 38 kilogram projectile) which was very useful for direct support. Organized into companies of six guns each, they provided good service as long as the vehicles stayed in service. The conversion was very crude compared to later ones, many of which involved purpose-built chassis, as all the Germans did was strip of the Pzkw. I turrets add a “keeper” bracket to mount the wheels and trails of the howitzer on its field carriage, and add a top-heavy and clumsy casemate to at least provide bullet-proof protection for the crew from enemy infantry. DML has now taken its collection of Pzkw. I kits and modifications and the nicely developed s.IG. 33 kit which has shown up in parts on Gw 38 series chassis, thrown in some new sprues and casemates for the s.IG. 33 (Sf) auf Pzkw. I and the howitzer carriage, and come up with a nice new kit of this ungainly vehicle. DML also has provided TWO different casemates with the kit, both with their “Razor Edge” molding, packed with a vacuformed keeper underneath them to maintain integrity and keep them intact. The casemates come in a single piece with add-on “wings” and bases. The s.IG. 33 now comes with three new sprues – one with its lower carriage and trails, one with its wheels and one with its ammunition. These are not quite the same as the rounds provided with the Pzkw. 38(t) based kits, and also come with different fittings and four DS plastic “rattan” like shell cases for transport. Construction follows past DML Panzer I kits. The wheels each have two brass rings which attach to them to provide rims, and all of the parts attach to a central chassis pan with fenders molded in place. Tips and other details attach separately to the fenders. The previous forward interior bits are also provided – seats, transmission, floor, etc. – but no engine is provided, mostly because if the howitzer is in place it cannot be seen (or serviced in real life!) Only half of the normal compliment of clear parts are provided as the upper sections of the casemate under the turret have been removed in order to mount the casemate. Note that three of the rounds in their carrier baskets mount on the fenders with brass straps. The howitzer as noted comes with its lower carriage, as the actual vehicle simply “piggy-backed” a complete howitzer onto the chassis. Each of the steel wheels comes as one central molding with a separate brake drum assembly and carriage fittings. Note that while the actual gun had about 11 degrees 30 minutes (5 degrees 45 minutes left/right) the one in this kit is fixed. Somebody does need to talk to DML’s direction production section, for this kit has a number of dumb errors. For example the nicely done turned aluminum barrel is not included in the inventory but is listed as part “MC1" inside the directions. Also not one of the ammunition elements (rounds, propellant charges, and what appear to be racks and other accessories are covered, described or even mention other than a layout diagram of the sprue. It’s not a good way to win friends and influence customers to provide very nicely done parts – and then not explain what to do with them! Other glitches include showing the “Magic Track” links completely assembled and then stuck on the model; not going to happen! Also note that the howitzer HAS to install in the hull first in Step 25 BEFORE you install the casemate assembly. This is due to the fact that DML used “slide molding: to replicate the bulges on the sides to clear the wheels and you have to be able to “spring” the casemate over the wheels to install it. The project was supervised by Hirohisa Takada and technical assistance was provided by Ed Kusiak, Jon Feenstra, Tom Cockle and Gary Edmundson. Artwork is by Ron Volstad. Five finishing options are provided along with a sheet of targeted Cartograf decals: s.IG. Kp. (mot.S) 702, 1st Panzer Division, France 1940 (grey with white crosses, white 6 and divisional markings); s.IG. Kp. (mot.S) 704, 5th Panzer Division, Russian 1943 (sand with green stripes, black crosses); s.IG. Kp. (mot.S) 704, 5th Panzer Division, Russia 1941-1942 (grey with whitewash, black and white crosses, Gun C); s.IG. Kp. (mot.S) 703, 2nd Panzer Division, France 1940 (grey with brown patches, white crosses, “Edith” Gun E); s.IG. Kp. (mot.S) 703, 2nd Panzer Division, Balkans 1941 (grey with white crosses “Alter Fritz” Gun A). Overall this is a very nice kit of a really ugly vehicle! I do wish DML’s direction team would pay as much attention to presentation of the kit as their design team does in its attention to detail.